Where in Texas has King Arthur gone? 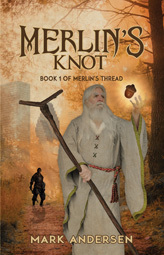 In this contemporary fantasy, Merlin the magician sleeps for fifteen hundred years…until his mystical connection to the mind of legendary King Arthur awakens him. Finally, the time has come to find the lost king and return him to his ancient destiny: saving the Britons in their hour of greatest peril. The quest leads Merlin to Houston, Texas, where his link to Arthur becomes hopelessly tangled. The snarl centers on Alfred, a laid-off engineer suffering his own existential crisis. After Merlin coerces his help, they follow their only clue to a suburb called The Woodlands. As they unravel the secrets of Arthur’s present life, returning the king to to his own time becomes harder. Now Merlin must find a way to reconcile free will with fate—and repair history’s tapestry. Merlin prodded me to tell his story for quite some time. The opening scene came to me in 2001, and the questions those few paragraphs raised intrigued me so much that I had to start writing to figure out why he had come to Houston. I finished the story a couple of years later, but my day job interfered with me finalizing it until I retired in 2015. Although the point of view character is not autobiographical, his position at the beginning of the book owes a lot to my (then recent) history. A year or so before I began writing the book, I was unemployed, the victim of a recent merger between two large oil companies, and I had spent considerable time in a job outplacement center. But I never met a druid while there. Merlin himself was a fascinating character who drove the story forward, and the other characters grew organically as the tale unfolded in my mind. The filthy old man blocked my way to the parking lot. Oh, great. A wino looking for applejack. Like I needed a hassle. No way. Not after spending another luckless day looking for a job. At least I hadn’t sunk that low. I wasn’t begging for booze. Not yet. I ducked my head and shifted to go around him—dismiss him—just wanting to get home. But when I raised my eyes to scan the lot for my car, somehow he blocked my way again. I pulled up short, sucking in a stale and musty aroma. Fishy smelling, not booze. He needs money to get booze. I didn’t want any part of him. His scraggly, white beard snarled around clumps of dirt and filth. And those eyebrows! Thick and long in a dusty mix of white and gray. How ancient could this guy be? At a wrinkle a year, a hundred at least. I lifted my briefcase, putting it between us, following an ancient instinct for a defensive shield. I glanced back toward the revolving door into the west Houston career center. A sporadic flow of people exited the building before it closed for the night. But of course, all of them looked another way, any other way. Why can’t this dirty old bum pick someone else? The rotating door slid to a stop, flashing our image. Odd. The reflection showed us almost the same height, but when I turned back, his head was tilted up at me. Must be the angle. If I tried to slip around him again, I knew I’d look foolish. I had to engage with him, tell him to go away. I couldn’t give him money. I didn’t have any to spare. That would be enough, surely. And since it was true, I could be sincere. Truly sorry, don’t you know? I looked into the old man’s face. My words froze in the steady gaze of the most arresting eyes I’d ever encountered. His protruding eyebrows framed gray irises, keeping me focused on his right pupil. That black spot expanded, drew me inward, became the only thing in my world. Bright flashes streaked by me, like being in the sky with a meteor shower. Then a few of them resolved into thick bands. They had substance—different colors of yarn flowing past me from every direction. As I watched, they multiplied again and again until they surrounded me, entangled me, lost me in complex interweaving strings of color. His words broke the spell. The world reappeared.